Josh Shoemake was born in Richmond, Virginia and attended Columbia University, after which he spent several years teaching high school literature at the American School of Tangier, then became headmaster of The American School of Marrakesh. He now lives in Paris and has published a number of stories and books, both fiction and non-fiction, including a history of literary Tangier, a Book of the Month in The Sunday Times, and one of Condé Nast Traveller’s all-time best travel books. 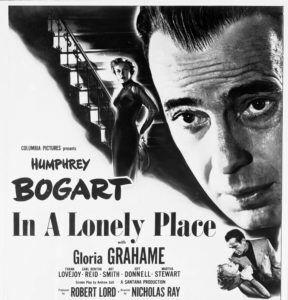 Every day I write consecutively about a single frame of one random minute of Nicholas Ray’s 1950 film noir classic, In a Lonely Place, starring Humphrey Bogart and Gloria Grahame. At 24 frames/second, one minute of film contains 1440 frames, so one second of film becomes about a month of my days.